It's not entirely clear if Giotto di Bondone was simply a contemporary or if he was a mentor but Pietro Cavallini certainly made his own mark as a Roman painter. After almost 800 years, it is little wonder that we know very little about the artist and perhaps somewhat miraculous that any of his paintings still exist. He signed his work pictor romanus therefore it is believed that he was from Rome. Dates of his birth seem to vary between 1250, 1259 and 1270. 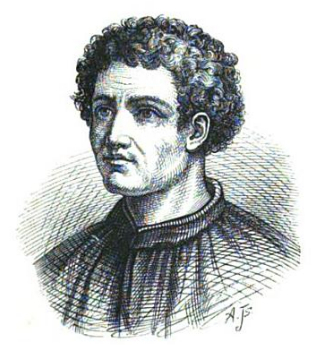 The engraved portrait of Cavallini is from the book Memoires of the early Italian painters, and of the progress of painting in Italy by Mrs. Anna Jameson in 1880. The portrait is signed by an unidentified artist and engraved by Shorn. She offers no further information on the drawing, so I am going to assume that this is an accurate representation of what Cavallini looked like rather than spend the time researching the portrait further. Cavallini is thought to have begun the movement away from the popular Byzantine style by blending it with a vivid naturalism, northern European styles and the artistic traditions of early Christian Rome. Some histories argue that Cavallini and not Giotto was the principle master for The Legend of Saint Francis, a fresco in Assisi. While many identify Cavallini as being a student of Giotto, it would seem after a little research on my part that they were most likely contemporaries of whom Giotto is simply the more well-known. Most agree that the two met after both had reached a level of professional success. A more accurate belief, my own, perhaps, is that the two famous artists pursued similar themes and while they may have influenced each other, there was no student/teacher relationship between the two. A more recent work blames Giorgio Vasari (1511-1574) for promoting Cavallini as a student of Giotto in an attempt to prove the superiority of Tuscan art. Discoveries of surviving works in 1900 and 2000 have renewed interest in Cavallini's work and contradict some of Vasari's claims about the artist. Cavallini's earliest known work was completed between the 1270s and 80s. Sadly, his frescos in the Roman basilica San Paolo fuori le Mura were destroyed by fire in 1823. We do have a record of this work because Cardinal Frencesco Barberini (1597-1679), in 1634, painted several watercolors of Cavallini's work. One reference mentioned that Pietro Cavallini and Giotto worked together on the mosaic over the grand entrance of St. Peter's. It is thought the Cavallini's best work was a fresco painting in the church of Ara Caeli at Rome. The fresco is of the Virgin and Child, surrounded by glory with Emperor Octavian who was looking at the holy pair. He is also celebrated for his fresco of the Last Judgement located in Saint Cecilia in Rome. 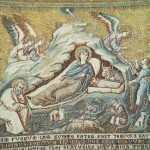 In the 1290s, Pietro Cavallini worked on mosaics depicting six episodes from the life of the Virgin. They were in Santa Maria in Tratevere was signed but can no longer be read. The scenes included Latin verses from Cardinal Giacomo Gaetana Stefaneschi, the brother of the project's patron. In 1308, he was hired by King Charles II. He went to Naples on a yearly salary of thirty ounces of gold with a housing allowance of two additional ounces. His efforts with lighting and transformative designs adorn the Santa Maria Donna Regina and date to 1320. In 1325, he returned to Rome, where he died in 1330.